Jon Zmikly leads a lecture in the Fundamentals of Digital & Online Media course. Photo courtesy of Cindy Royal. This piece is co-authored by Jon Zmikly. Core courses in a mass communication curriculum provide the foundation for a student’s program of study, introducing the baseline insights and skills to be applied to more advanced coursework. Within those scarce core hours that every student takes, a number of topics must vie for placement in the curriculum. Foundational items like writing, media history and law traditionally have been core requirements for journalism and mass communication students. "The view is that digital platforms are not simply another tool... but that digital technology profoundly alters the scale and scope of communication." Digital media concepts have been integrated into mass communication curriculum since the mid ‘90s. Programs began adding digital content to existing courses and offering digitally focused electives, like Web Publishing or Introduction to Multimedia. As digital and social media became more pervasive in society, these concepts became more prevalent in curriculum. Some programs exercised a convergence approach to digital in which print, radio and television were brought together. Others approached digital in a skills-oriented fashion, introducing image and video editing software and Web design techniques. 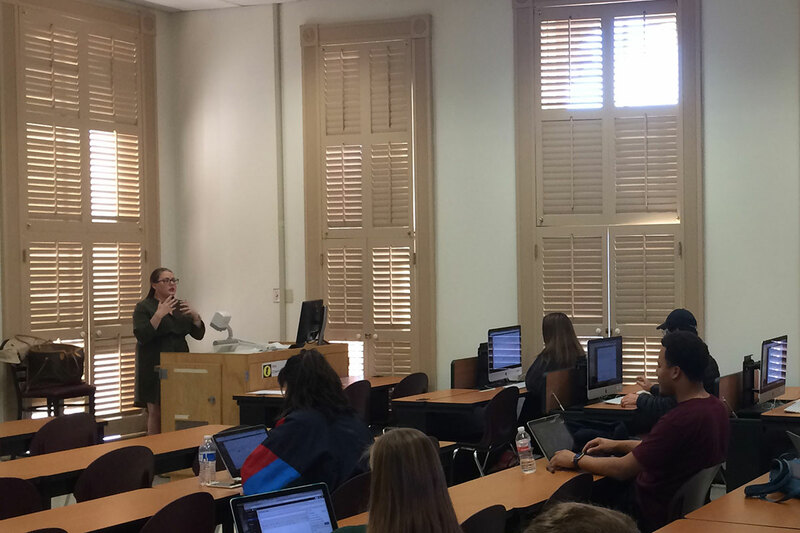 But in the School of Journalism and Mass Communication at Texas State University, we wanted to take a different approach to creating a core, digital perspective. Our goal was to integrate a broad appreciation for Web and mobile technologies with the ability to learn and stay up-to-date with skills. An innovative, digital mindset was identified as a key outcome for this course. Courses in Web Design and Visual Storytelling have been present in our undergraduate curriculum as electives for more than a decade. By the mid 2000s, the graduate program had developed a digital media concentration, and a digital media issues course, dealing with research and concepts, became one of the required courses for graduate students. In 2010, one of the authors, Dr. Cindy Royal, began teaching a new undergraduate elective called Social Media at Work. The course was meant to bring similar conceptual attention to digital media that was present in the graduate program, but offer it in a meaningful format for undergraduates. In the preceding years, social media had become an important professional communication tool and a popular pastime for students. But there was little overlap. Students weren’t necessarily considering the ways sites like Facebook, Twitter and YouTube could have a professional application. The course was delivered as a lecture, with an overview of Internet, Web and computer history, search engines, browsers, blogs, social media, mobile applications, multimedia, digital culture, data journalism, online business models and technology trends. Students also received a basic introduction to Hypertext Markup Language (HTML) and Cascading Stylesheets (CSS). The focus of the course was on exposure to the technology industry, critical thinking about digital’s effect on communication, strategic emphasis and innovation. The course became a popular elective. Evaluations indicated that it should be required for all students. After three semesters, a decision was made to revamp curriculum and develop the course into a core requirement for all mass communication majors: journalism, electronic media, public relations, advertising and general mass communication. Now renamed Fundamentals of Digital and Online Media (FDOM), students would emerge from the class with firsthand use of social media tools in developing a personal brand and an online presence that they could leverage in job hunting and careers. But most importantly, students would begin to appreciate how a digital mindset would be relevant to their future. The main project of the course was a personal blog/website on a topic of the students’ choosing. This allowed students to be creative, while practicing writing and visual skills and using social media promotion. Using the WordPress.com platform, students became familiar with the popular interface and a content management system that they would likely encounter in their careers. 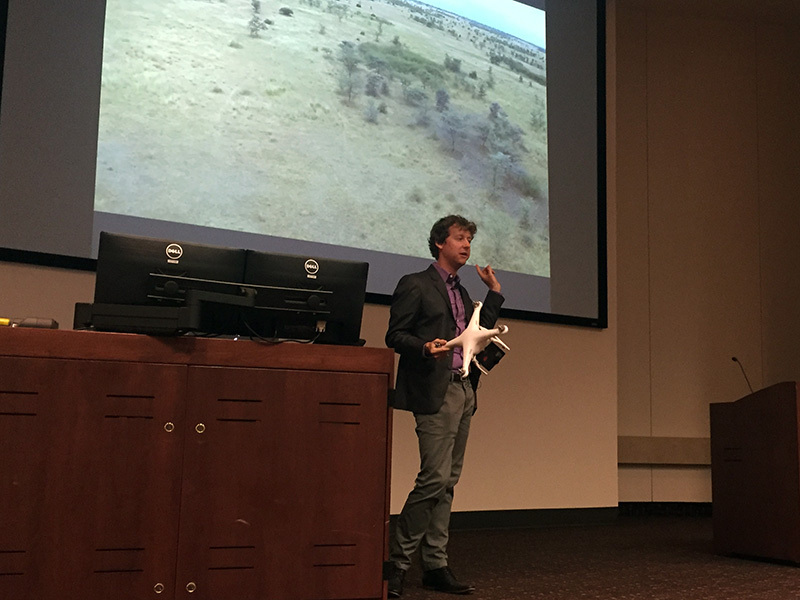 Guest speakers in lecture, like Ben Kreimer of BuzzFeed’s Open Lab, introduce students to cutting-edge, media innovations. Photo courtesy Cindy Royal. But with more than 2,300 majors in our program, a course that was previously taught to 50-100 students per semester was going to need a new model. In 2011, senior lecturer Jon Zmikly (also an author of this piece) took over instructional duties for the course. He developed a model with large lectures twice per week to 300-400 students. The blog project was maintained, but providing consistent feedback on that many blogs became difficult. The instructor created a rubric that captured the requirements of the project, to be graded at midterm and final portions of the semester. The rubric included measurements for writing and use of digital features like links, visuals and site widgets. In addition, the course deliverables included midterm and final exams, with additional assignments of a Twitter Scavenger Hunt (often in conjunction with other universities) and a prototype for a mobile application. Students now receive skills training in smaller lab sessions that complements the digital perspective introduced in lecture. Photo courtesy Jon Zmikly. As grading for the course became more onerous, faculty also began to consider how the course could become a vehicle for more skills-oriented training. Students needed to have basic image editing and multimedia skills. And they needed more accessible instruction in smaller sections with knowledgeable instructors. In 2013, faculty began working on a hybrid model composed of three elements: lecture, smaller lab sessions with graduate teaching assistants and online modules. 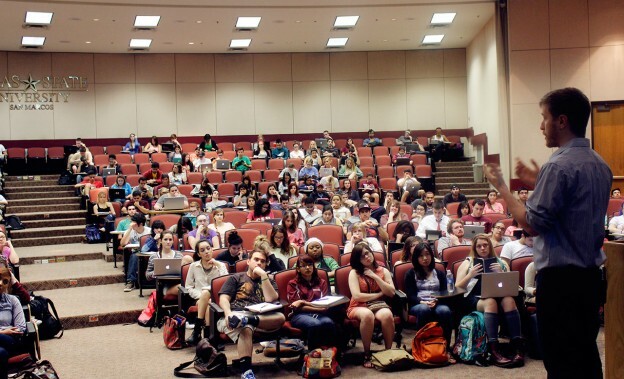 A lecture is taught to 200 students in two different sections, each meeting once per week. Smaller lab sessions with teaching assistants are now required every other week. In alternating weeks, online modules introduce new concepts and reinforce lecture and lab topics. 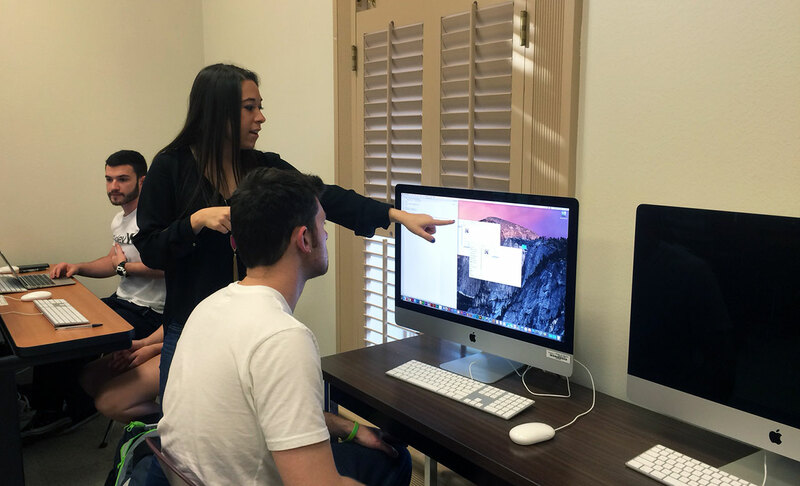 In the lab sessions, students receive one-on-one assistance with their blog, HTML/CSS exercises, mobile app assignment and image and video editing projects. Two additional blog reviews, for a total of four per semester, were added to provide more consistent and in-depth feedback. Graduate assistant instructors became responsible for grading all assignments, including blog reviews and exercises. Graduate assistant Sara Shields helps a student with the HTML assignment. Photo courtesy Jon Zmikly. The approach has been to completely rethink the role of digital in curriculum. While skills are addressed in this model, they are integrated into the overall innovation philosophy of the course. The view is that digital platforms are not simply another tool in a communicator’s tool kit, but that digital technology profoundly alters the scale and scope of communication and uniquely supports models of participation, interactivity and engagement. As such, it is important that instructors and graduate assistants in this course use digital technology regularly in order to understand their broader implications. Instructors’ use of platforms – Twitter, Facebook, Snapchat, YouTube and more – should model desirable behaviors for students and allows both student and instructor to learn from one another. Student comments reflect the value of this broad-based, digital-first approach. Recruiting and managing a knowledgeable team of teaching assistants and instructors – a teaching clinic is held each year to train incoming graduate assistants. The FDOM course has become the foundation of the digital emphasis in our program. Not only is it beneficial to undergraduates, it provides valuable teaching and digital experience to our graduate student instructors. We have built on this foundation as a launching point for other digital activities in our program: an Advanced Social Media and Analytics course, Web Design and Coding and Data Skills courses, a digital, short-course series, a Digital Entrepreneurship Speaker Series, a Digital Media concentration and a new major in Digital Media Innovation that is in final review stages. For more information on the FDOM course, visit digital.jonzmikly.com. Cindy Royal is an associate professor in the School of Journalism and Mass Communication at Texas State University, where she teaches Web design and digital media topics. During the 2013-2014 academic year, she was in residence at Stanford University as a Knight Journalism Fellow, working on a platform to teach programming skills to journalists. In 2013, she was awarded the Charles E. Scripps Journalism and Mass Communication Teacher of the Year, presented by the Association for Education in Journalism and Mass Communication and the Scripps Howard Foundation. More information can be found at cindyroyal.com. Jon Zmikly is a senior lecturer in the School of Journalism and Mass Communication at Texas State University, where he teaches digital fundamentals and Web design courses. He also manages the school’s website, blog and social media accounts. Zmikly earned a master’s degree from Texas State University in 2009. He is the youth pastor and webmaster for San Marcos Community Church and works on freelance web projects. More information can be found at jonzmikly.com.